Help me Design a pergola! Looking to put a pergola against the house. I want it 16 ft wide, 10 ft long, 9 feet tall. 6 x 6 post on concrete footers. For the 16ft span. What size 2x do I need? notching the post to set the 2x is what I am thinking. 2x8's is what we used. It came from a kit. Notched 6x6, then 2x8s on the notches, then used 2x8's with notches for the beams across that, then 2x2's on top of that. Last edited by RedRaider323; 05-29-2018 at 10:19 AM. A general rule of thumb is 1.5x the nominal size. Since you're not going to load that member, you could get away with a little less, but I like to overbuild ... I hate nothing more than sagging wood! And make sure you check with the HOA first if you have one. 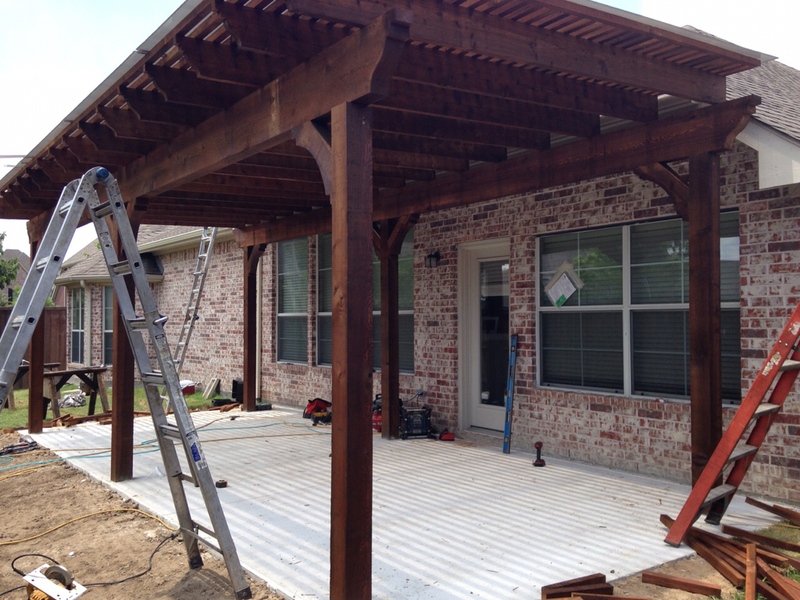 Mine was a little larger at 12x28 but plans show 6x8 cedar beams with a 12' max span. I can't get the plans to copy on here, but could email the plans if you think they might help. 6x6 posts, 2x6 rafters, 2x2 top with polygal cover for shade, freestanding from house. This is the one I built a few years ago. We sit under it every afternoon while the kids play in the backyard. Did you also sandwich the header beams that are running parallel to the hardie plank siding? helps a lot with shad. They look nice. etc. Im actually going to sheet this one. but want the look of a pergola. Mountaineer, would you mind sending me a pm with a ballpark number on what something like this cost? I am wanting this exact thing in my backyard. Was this a kit or did you hire someone to do a turn key install? Thanks for the help!